A family run Italian restaurant, one of Sheen’s oldest established restaurants offering traditional dishes from all over Italy. A superb selection on the menu featuring halibut, sea bass and other fresh fish when in season, as well as veal, steaks, lamb and pasta dishes. 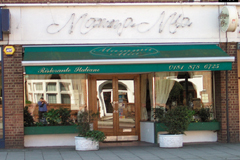 A warm and friendly welcome awaits you at Mamma Mia. Open every day for lunch 12-3pm and dinner 6-11.30pm. All major credit cards accepted. No service charge. Traditional regional Italian cuisine with fresh fish a speciality.